Let’s be honest, I’m not exactly a long-term relationship kind of guy when it comes to my golf clubs. I’m much more of a serial dater. I recently blogged about how many drivers I\’ve been through in recent years. The number is pretty significant. I have a little longer attention span with irons — I had a set of Callaway X-18s for several years — but I’ve been bad of late. Last fall, I picked up a set of TaylorMade Burner 2.0 irons. I bought into the hype of picking up distance. I wanted long, I wanted to hit the ball further than ever. In retrospect, it seems like such a poor decision. I am, admittedly, not a long hitter. Through both club and ball technology, I hit the ball futher than I ever have. But I often hit 6- or 7-iron on a par 3 when a friend might hit 8-iron. I wanted that to change. But the thing I overlooked in all of this is that when I play my best golf, it is when I am in control. It’s when I hit fairways, I hit a bunch of greens and I hit a couple close enough to make easy birdies. And going for distance runs counter to that. I never got comfortable with the Burner 2.0s. Much of that had to do with distance. And maybe not for the reason you might think. I didn’t have a problem with the new math of the clubs, that I might hit 8 where I used to hit 6 or 7. I can do that. The problem that I had was that the Burner 2.0s can come out of nowhere and launch a ball that never comes down. I am struggling with these. My past two rounds I’ve had shortish irons into greens (a 7 yesterday and an 8 this morning – both from the fairway), I’ve put a good swing on the ball and they have flown like crazy. Totally airmailed greens and led to two doubles. For the most part, I like the irons. But if I don’t know how far they are going to go, they aren’t worth a whole lot to me. Let’s just say I wasn’t alone in experiencing hot spots. For me, not knowing how far the ball is going to go with a good swing is a pretty hopeless feeling. So that means only one thing: New sticks. Because while I have owned a lot of clubs over the past 30 years, I have never owned a set of forged irons. I always felt like I didn’t have the game for them, that I needed the help that game-improvement and super game-improvement irons provide. I figured that after experiencing the lack of control that can sometimes go along with cast irons, there was no better time to try some Mizuno forged irons. Now don’t get me wrong, these are far from blades and they will certainly help a guy who doesn’t hit the sweetspot every single time. There’s some perimeter weighting and that is a big bonus. 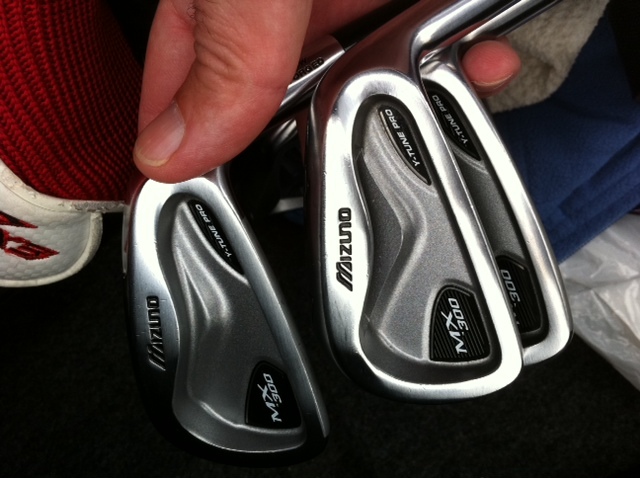 These are the MX-300s from Mizuno that were only available in 2010. For some reason, they were produced for only the one year and were eliminated from the line in favor of the JPX 800 Tour irons. I did look at those, but couldn’t imagine that they were $300 better than this slightly used set. Plus I’m going to simply say that the MX-300s look much better. My guy Scott at 2nd Swing tried to get me into these last year, but I still wasn’t sure I had enough game. So he was happy to get me into them this week. I took the new sticks out for a first date last night after work and the initial results were pretty good. The ball got airborne, I hit the 4-iron as a layup on a couple of par 5s it didn’t lead to awful shots and they go pretty darn straight. I know I’m only 18 holes into this, but they felt more forgiving than I would have guessed. And then there is the feeling you get when you hit one well. So sweet. I have a pair of forged Scratch wedges, so I have an idea of what it is like. But it does feel good to hit a forged club on the center of the clubface. I had a couple of those and it was quite nice. There’s still a little adjustment that will have to be done — I actually went right to the first tee rather than the range as I had a chance for a full 18 holes if I immediately started playing — but they seem good. – Last weekend, I spent $21 or so to swap out the empty propane tank for my grill and replace it with a full one. I’m curious as to how much Golden Valley Golf and Country Club is spending on propane. Best I can tell from the road, the club is using propane heaters to create a good growing environment for their greens that suffered damage over the weekend. There have been massive propane tanks near a few of the holes north of Golden Valley Road. My people tell me three greens remain closed. – Today is my birthday and for the second consecutive year, there isn’t golf-friendly weather. Oh well, it happens. – This one is a couple of weeks old, but I still need to share. It is also meant primarily for my friends in the media. When a pro athlete says they are going to try to be a pro golfer when their career is over, just smile and nod, but don’t write a thing in your notebook. And certainly don’t write a story about it. Why? Because golf is hard. Really hard. Just ask John Smoltz. The ex-MLB pitcher had a reputation of being a very good player. He has talked about the Champions Tour. So he gets a sponsors’ exemption to the Nationwide Tour’s South Georgia Classic. And what happens. She shoots 84 and 87 to finish DFL and miss the cut by 27 shots. Yes, 27. – There was a story in the Star Tribune last week about Minnesota high schools students going elsewhere to go to school and work on their games. In that story, it said that one girl is going to skip the state high school tournament this year in order to play in an American Junior Golf Association event that week near Rochester. I understand and realize that summer golf is way more important than high school golf, but I thought this was unfortunate. I guess my biggest beef is why the AJGA needs to play one of only two Minnesota events at the same time as the state high school tournament. They couldn’t hold it a couple of days later? I know the AJGA can do what they want, but this seems unfortunate. There will be girls who want to play, but can’t or choose not to. At my club, for example, there is a girl who finished in the top 10 at the state meet next year as a sophomore. It would probably help her to play in the AJGA event. But her high school team very well may play in the state meet. That’s all I’ve got today. Coming soon: Pics and words about what might be the best value/low budget golf option in town.